Find your nearest Mrs. Fields cookie shop with our store locator and pick-up your favorite fresh baked cookies and gourmet cookie gift baskets for any occasion today! Our cookie stores offer a wonderful array of cookie bouquets, brownies, Nibblers, and other delicious treats everyone will love. Order and pick-up personalized cookie cakes or stop by for a freshly-baked treat today! 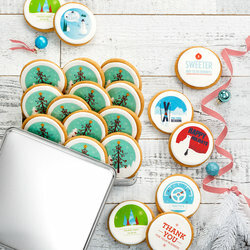 Order your favorite holiday and Christmas cookie gifts this year. Prepare for special get-togethers, parties, or just to spread the holiday cheer. If you're a business, don't forget to pick from our collection of corporate gifts for clients. Swing by one of our locations and shop our variety of gourmet cookie gift baskets that everyone loves.